Welcome to piCture pOlish Blog Fest 2012! Lots of bloggers all over the world are participating in this wonderful day, so you should be seeing some great swatches of some great polish! I am honored that I was chosen to showcase Tease and Warning for this event! Tease is a new 'Mesh' shade and will be available from piCture pOlish on-line and from all Network members! Warning is also new and will be available from piCture pOlish on-line and from all Network members! 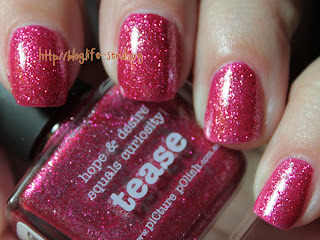 So when I went to put on Tease, I was simply amazed at the glitteriness. It sparkles like a maniac! It's like a pinkish reddish glitter bomb that doesn't feel gritty much, even without top coat. Pictured here is two coats, only for good measure, because this baby could have been golden in one coat! I liked it...but I didn't think it looked "square" enough. Be sure to visit piCture pOlish on Facebook, Twitter, Pinterest and their website. There you can get updates of the new collections and other news!